Having Fruit For Breakfast is a great idea for yourself, or for a menu idea when hosting overnight guests at your home ... make a simple fruit salad with yogurt and granola. Starting the day with fruit is a good idea, and serves to provide you with much of the daily requirement for fruit. 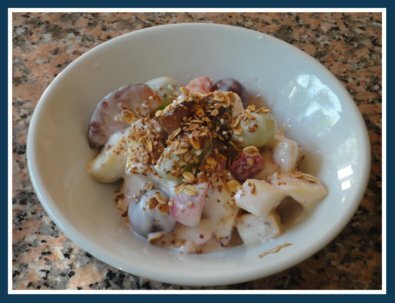 This breakfast, or brunch, fruit salad recipe is very quick and easy to make. It can be made ahead of time, for example, the night before, so as to have it ready to go for the morning breakfast. If you are preparing this fruit salad the evening prior to the day in which you plan to use it, combine only the prepared fruit. Add the yogurt and the granola just prior to serving the fruit for breakfast. Note - this recipe will serve about 6 people. If you wish to make enough Breakfast Fruit Salad for more people, simply increase the amount of each, or several of, the fruit types accordingly. This recipe makes a healthy, low fat breakfast or brunch idea to accompany other breakfast or brunch foods, for example muffins, breads, waffles, pancakes, or as a complete breakfast or brunch idea. In a bowl add together the apples, nectarines or peaches, raspberries, strawberries, blueberries, green grapes, and the red grapes, and gently combine. Add the yogurt and stir gently, so as to combine the ingredients without breaking the fruit too much. Sprinkle the granola over top of the fruit salad. Sprinkle the nuts over top of the fruit salad, optional. Serve into individual serving dishes, or allow guests to serve themselves.